While it was no bombshell in terms of its beauty, don't let that fool you: despite its rather homely looks, this torpedo bomber saw some major wins. During its operational use during WWII, nearly 10,000 of them were produced. Who's the beauty queen now? At a brief point in aviation history, the Douglas TBD Devastator torpedo bomber was the most advanced aircraft--certainly for the US Navy, and potentially for any navy in the world. However, the super fast paced nature of aircraft development made it practically obsolete within only a matter of a few years. Here comes the Avenger to save the day. Grumman was selected to design aircraft that could replace the TBD and the Navy ordered 2 prototypes in April 1940. Leroy Grumman (the co-founder of Grumman Aeronautical Engineering Co.) designed and called the XTBF-1, which was flown for the first time on August 7, 1941. Although the first 2 prototypes crashed, rapid production of the TBF continued. 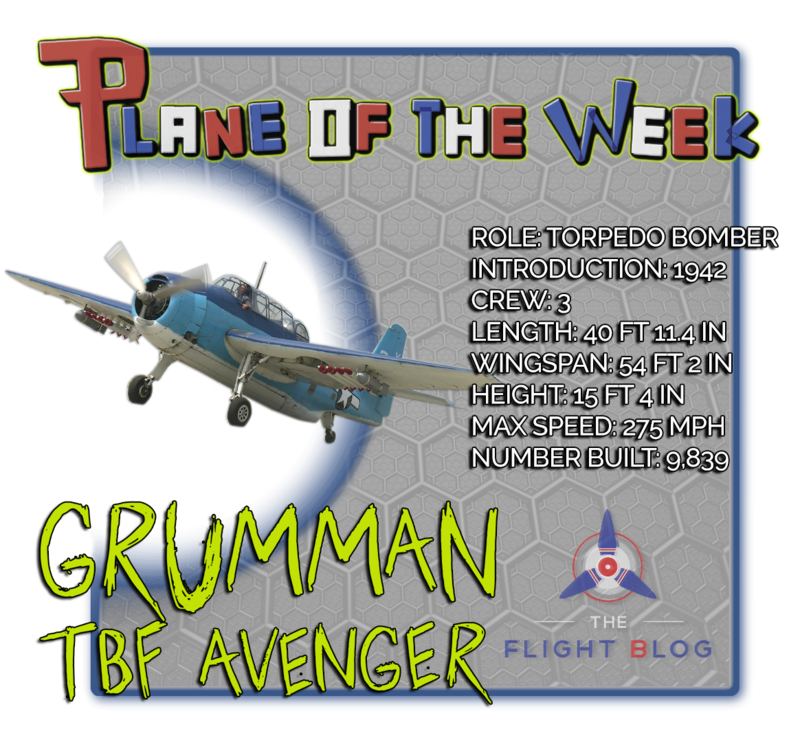 The TBF Avenger, which marked a first for Grumman by being their first torpedo bomber, also had the distinction of being the heaviest single-engine aircraft of WWII. Its design was marked by a new "compound angle" wing-folding mechanism created by Grumman to maximize storage space on aircraft carriers. Its design was further characterized by its rather portly fuselage, 3-man crew (pilot, turret gunner and radioman/bombardier/ventral gunner), and multi-faceted capabilities. Its armaments included a .30 caliber machine gun mounted on the nose, a .50 caliber gun mounted next to the turret gunner's head in a rear-facing electrically powered turret, and a .30 caliber hand-fired machine gun mounted under the tail (used to defend against attacks from below and behind). Later models got rid of the nose-mounted gun in favor of a single .50 caliber gun in each wing (per pilots request) for better firepower and increased strafing ability. The Avengers also had a large bomb bay for either one Bliss-Leavitt Mark 13 torpedo, a single 2,000 pound bomb, or up to four 500 pound bombs. Overall, the TBF Avenger was rugged, stable, and had good radio facilities, docile handling, and long range. It was superior to previous American torpedo bombers and its Japanese counterpart, the obsolete Nakajima B5N. Coincidentally, the new TBF Avenger was put on display to the public on December 7, 1941--the same day the Imperial Japanese Navy attacked Pearl Harbor. After the ceremony opening the new manufacturing plant, Grumman quickly sealed the plant to guard against any possible sabotage. By June 1942, more than 100 Avengers were sent to the Navy. However, they arrived a little too late and therefore a majority of them weren't participants in the Battle of Midway. Six TBF-1s were part of the VT-8 Torpedo Squadron while the rest were Devastators. Both types of bombers suffered heavy casualties: of the 6 Avengers in the squadron, 5 were shot down and the 6th returned heavily damaged and with its 2 surviving crewmen injured. The Battle of Midway emphasized how outdated the Devastators were and the dire need for new aircraft. On august 24, 1942, 24 TBFs participated during the naval aircraft battle at the Eastern Solomons and were able to sink the Japanese light carrier Ryūjō and claim a dive bomber. Seven aircraft were lost. In November 1942, Marine Corps and Navy Avengers helped to sink a Japanese battleship at the Naval Battle of Guadalcanal. While torpedoing surface ships was their "traditional" role, TBF Avengers were one of the most effective sub-killers in the Pacific theater and the Atlantic, there they helped ward off German U-Boats and provide cover for the convoys. George H.W. Bush, the youngest naval aviator at the time, flew a TBM Avenger (a TBF variant manufactured by the government's "Eastern Aircraft Division). While engaged in operations against the Japanese in the Bonin Islands, Bush was one of 4 aircraft that attacked the small naval base at Chichijima. During the attack, his Avenger was shot down on September 2, 1944. He managed to release his payload before bailing out over the water. Both his crewmates dies and he was awarded the Distinguished Flying Cross. Towards the latter part of WWII--and beyond--the TBF Avenger into a number of useful roles, including dedicated reconnaissance platform, target towing, airborne early warning (AEW), anti-submarine warfare (ASW), and light carrier-based transport. Several other countries have operated Avengers for military use, including Brazil, Canada, France, New Zealand, the United Kingdom, and Uruguay. A fair amount of Avengers survived beyond the war and into the 21st-century, mainly working as spray applicators and water-bombers throughout North America. Forest Protection Limited (FPL) of Fredericton, New Brunswick, once owned and operated the largest civilian fleet of Avengers in the world having purchased 12 surplus TBM-3E aircraft from the Royal Canadian Navy.